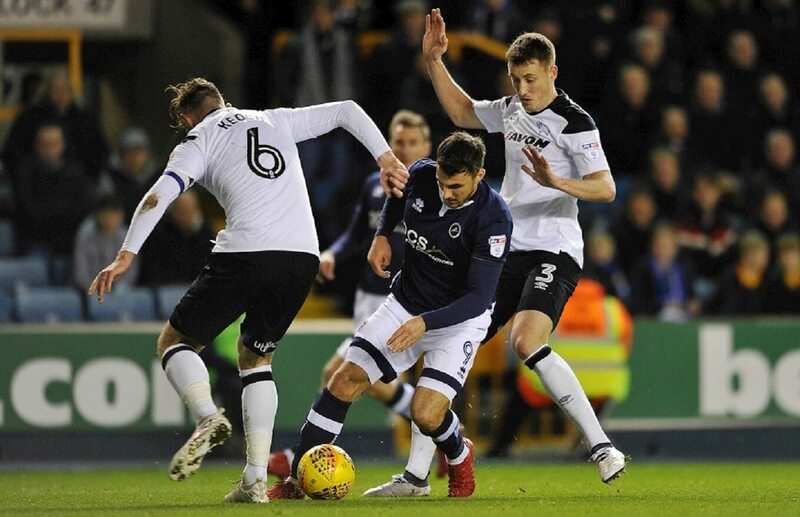 No goals – no excitement – no win for Millwall and visitors Derby County as they drew 0-0 in an incident starved match at the New Den on Tuesday night. In case you had just creosoted the garden fence in expectancy of another late January frost it might have felt better to watch the creosote dry rather than be haunted by a dire 0-0 draw in freezing temperatures in South London. The biggest cheer of the night went to Australia international Tim Cahill who was not in Millwall’s squad but was re-introduced to the home fans after his re-signing for the Lions in the transfer window on Monday, on a deal until the end of the season. Oh and how they could have used him on the pitch as the Londoners lacked any sort of creative spark in the middle of the pitch. Once again Millwall put up the barricades at home in the defence as they had possession of the ball for a measly 41% of the game. This appears to be an ongoing occurrence in almost every home game Millwall have played in over the season and it really is surprising no team has turned up and played them at their own game. The Lion’s target is obvious for this season, stay in the Championship division and consolidate and look to make inroads on the play off area of the division for next season by hook or by crook. So if you want pretty football then the New Den is not the place to be this season. Maybe next though. Neil Harris’s game plan is working though at home as the Lion’s are picking up draws and victories with the odd defeat. This conflicts totally to Millwall’s dreadful away record of mostly defeats with the odd draw and even more unique win to keep them on course for a mid table position. Here they played an in form second placed Derby team looking to take control and possession of the game and come away with three points. It didn’t work as Millwall were resilient to withstand the 59% of possession the visitors had on the night. Yet a lot of the play was in the middle of the park and County couldn’t muster a sausage roll in the wintery conditions let alone a goal. Millwall’s Harris made three changes to the side that started the previous league game, the superb 4-3 win at Leeds United and seven from Saturday’s FA Cup fourth round draw with Rochdale. 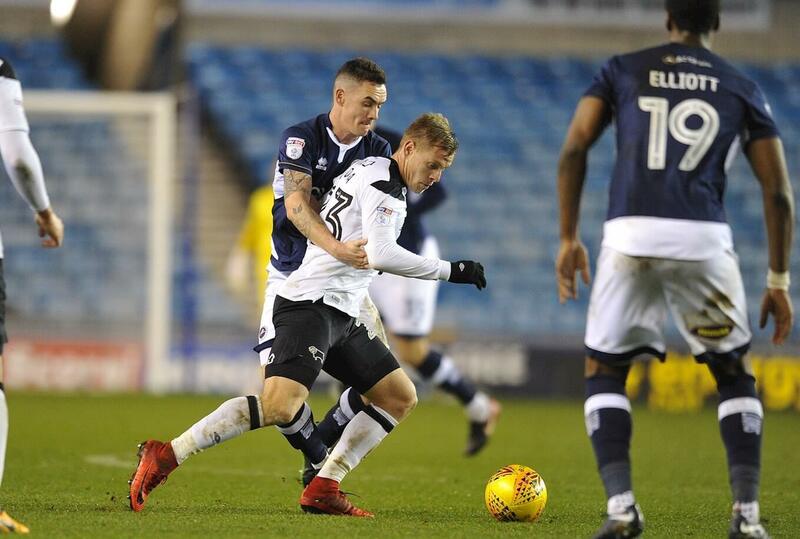 Former Rams trainee James Meredith faced his former club once again, having been part of the side that lost 3-0 at Pride Park just before Christmas and Derby defender Jason Shackell was not eligible to face his parent club due to the terms of his loan deal. The Lion’s Shaun Hutchinson made a goal saving block to deny Derby’s Matej Vydra while the hosts were not given a penalty when Lee Gregory was caught by a high foot. Derby County keeper Scott Carson in excellent form between the sticks this term did well to save Jed Wallace’s effort with his legs and at the other end substitute Ikechi Anya did find the net for the visitors seven minutes from time but was correctly flagged offside. A real pity for Anya as he had only been on the pitch for 2 minutes and the first time in a Derby shirt since August. Still the Londoners moved up a place in the Championship table to 14th above County’s arch rivals Nottingham Forest, but might have taken all three points had Hutchinson been given a spot kick when his shot appeared to strike a Derby hand late on in the match. As for Derby, they remain in second but have a slim lead over third placed Aston Villa that was cut to one point after the claret and blues won 1-0 at Sheffield United. Gary Rowett’s Derby side struggled to test Lions’ goalkeeper Jordan Archer throughout the game as Millwall shut up shop fr another valuable point against a top six team.